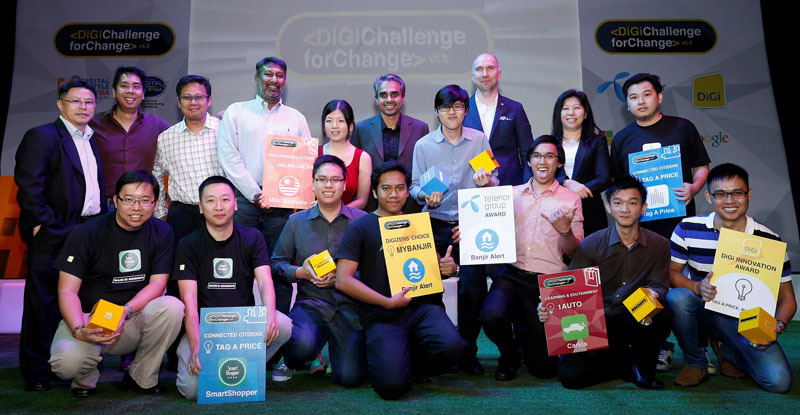 DiGi has partnered with Google Malaysia, Microsoft Malaysia, PEMANDU, iM4U and MDeC for the latest DiGi Challenge for Change 5 where they not only discover talents but help them develop & succeed. "Bringing Malaysians Together, One App at a Time"
Over 2500 contestants were narrowed down to 60 ideas who then attended #IdeaJam to be guided by special mentors to refine their idea. 20 shortlisted ideators will get the opportunity to pitch their idea to the panel of judges. 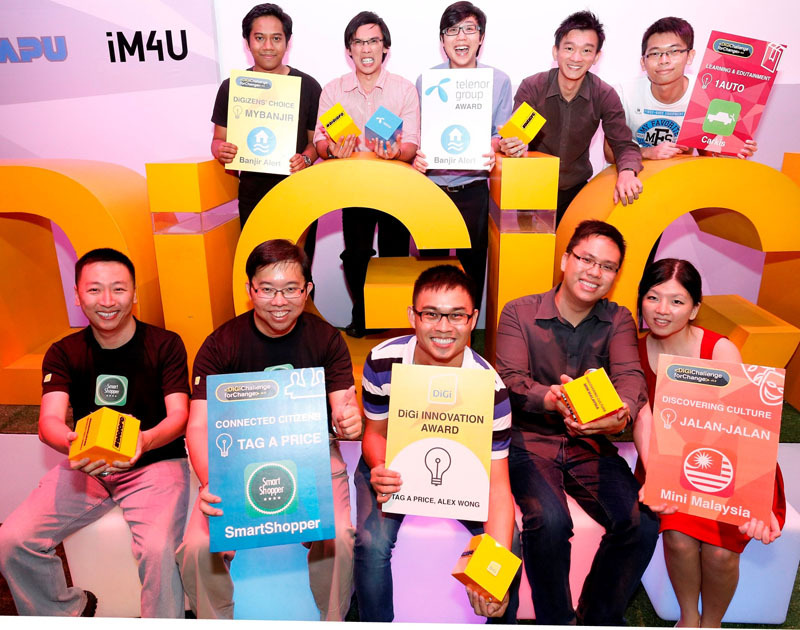 Winners from each category received RM 5,000 and a smartphone. Network of information regarding local food, tours and transport systems to ease local traveling. Provide tips to ensure your car is in good condition, a search function to identify and solve problems and enables mileage tracking to remind users to service their cars. Making running run by creating a virtual dog to run along with you and grows as you improve your run-time. Connects users with Kementerian Perdagangan Daman Negeri, Koperasi and Kepenggunaan e-service database, known as Pricewatch. The app will push early flood alerts to Malaysians in high risk areas, help connect stranded victims to nearby evacuation centres, and provide a collaborative platform for volunteers and relief organizations to mobilize aid speedily to affected communities. In the second phase, app developers were invited to a 36-hour Hackathon, HACK!DiGiCFC, where they worked on the winning ideas in Phase 1. On Demo Day, they showcased their mobile apps to the mentors to comment and guide them further. Winners will have their apps marketed on the DiGi online store (Google Play Store, Windows Store and App Store) and users, exposing them to the industry and allowing them to expand their talents. Each winning app will also earn RM 25,000! Tag A Price won the best overall idea and will receive a sum of RM 25,000. Wong was actually a previous winner but he came back with more amazing ideas! This award went to the best developer/team - Banjir Alerts, who will represent Malaysia at Telenor's Digital Winners Global App Developer Challenge in Norway. Prizes also includes this programme by Digital Malaysia, including the Green Lane for the top developer/team which develops them into a start-up complete with a mentor, funds and market opportunities. Tan Yin See and Barry Loh were also announced as the winners for top Android and Windows app developers, allowing them to participate in Google Malaysia and Microsoft Malaysia's short 'insight' stints, giving them the opportunity to receive knowledge from experts. It's good to see a brand that is helping out the community and people. Last year's winner got the change to go overseas and met the founder of Wikipedia. The business also bloomed from 4 to 13 staffs in a small venture. DiGi Challenge for Change has also helped produce applications like My Tradisi which allows users to experience traditional games. They are currently working with the Muzium Negara to build more apps.